Some of you may be familiar with the Magic Tree House series for your kids. If you get the Scholastic book order from your Homeroom Mom, you will see a smattering of Magic Tree House books throughout. They are a great first step in chapter book reading, even if you are the one reading them to your child. If they are not ready yet to read a chapter book, but you read a couple chapters a night to them, they get a taste of the story every night and get excited about delving into them again the next night to see what happens. The funny thing, I thought my daughter outgrew this series as she has been moving into longer chapter books on account of beginning third grade. But I have discovered a couple of things. One is that my child's growing independence in reading as well as her "silent" reading skills is giving old chapter books that I thought we were done with new life. It is as if my daughter is rediscovering them on her own, at her own pace. And because these books are a little easier than the longer chapter books she is tackling, it is giving her more confidence as she peppers in these Magic Tree House books to her reading schedule. She gets through them quickly and adeptly, giving her a sense of accomplishment when she is done. So don't throw away those early chapter books too soon! 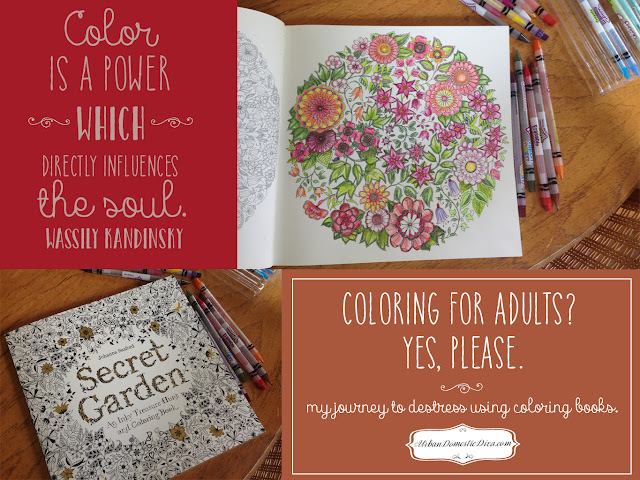 They may be a good way to ease the transition to harder reading for your child. 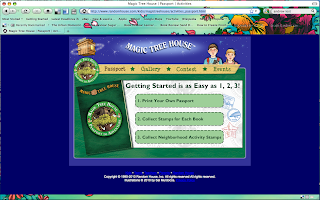 Secondly, we discovered tonight that The Magic Tree House series has a great passport program online. 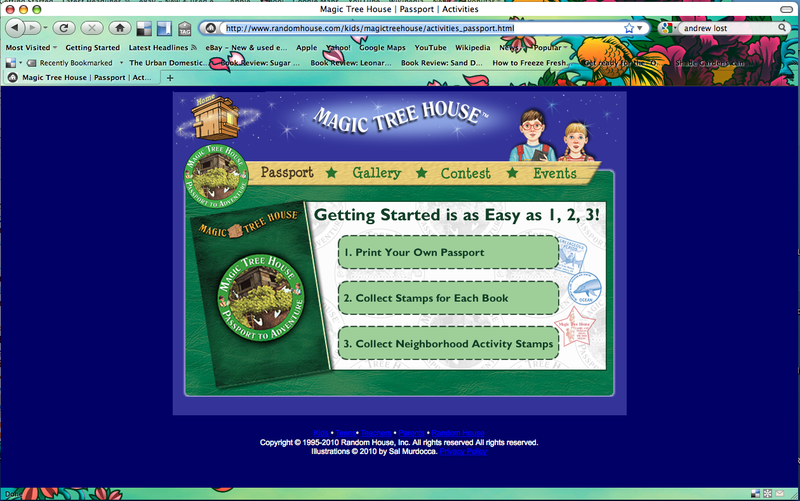 (http://www.randomhouse.com/kids/magictreehouse/activities_passport.html) This is a great reward program for your child to entice them to keep reading. It is also a great way to teach them reading comprehension. 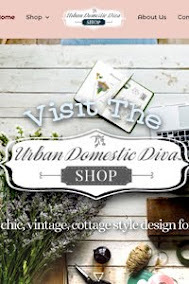 The program is so simple and easy to navigate. You print out a 20 page pdf that is your child's passport which you can staple or put in a binder. Than as they finish each adventure, you take them to that book's online quiz, and if they answer the three questions correctly (based on the story) you can print out their "passport stamp". This quiz is short, but it really helps your child think about what she read and if she remembered key points in the story (again, GREAT for honing comprehension). They then cut out the stamp and put it in it's proper place in the passport book that they save. 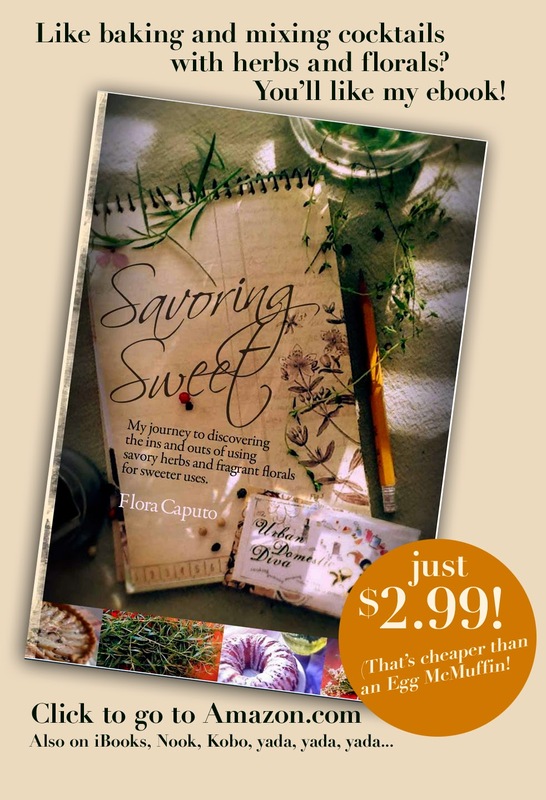 As she reads each book, she can collect that stamp until the passport is filled. My daughter was so excited about it! I was very surprised. She is a strong reader, but it has been hard to get her really engaged in reading. She brought down all the books she already read and we spent an hour doing the quizzes and getting her passport book up to speed. She now wants all the missing books so we can keep filling her passport. I did notice some other popular series that also have online components to help parents incent their child to read. If your child has become interested in a certain series (The 39 Clues, The Babysitter's Club, Andrew Lost, etc), check and see if the publisher has put something together online to engage them further. It will be worth the search. You can also create your own passport program at home, where your child needs to write a page report or draw a picture of the story, and they get a sticker in a "passport" book you can make for them. Maybe when the passport is filled, they can have a big reward that would really excite them and keep them reading. I was once told by a sage Grandfather that if you want someone to keep doing something, reward the behavior you want. Well, it seems to be helping here for reading. I was genuinely shocked at how excited my daughter was at this passport program. We'll see if it lasts!